The theme for Charity event of easter celebration with KMK Faculty of Economics and Business Universitas Brawijaya this year was taken from 1 John 4:11 “Dear friends, since God so loved us, we also ought to love one another.” as the meaning of the resurrection and sacrifice of the Jesus Christ. The Easter celebration was held on Saturday, April 14, 2018 at Villa Cherry Orphanage, Desa Sumber Rejo, Batu. 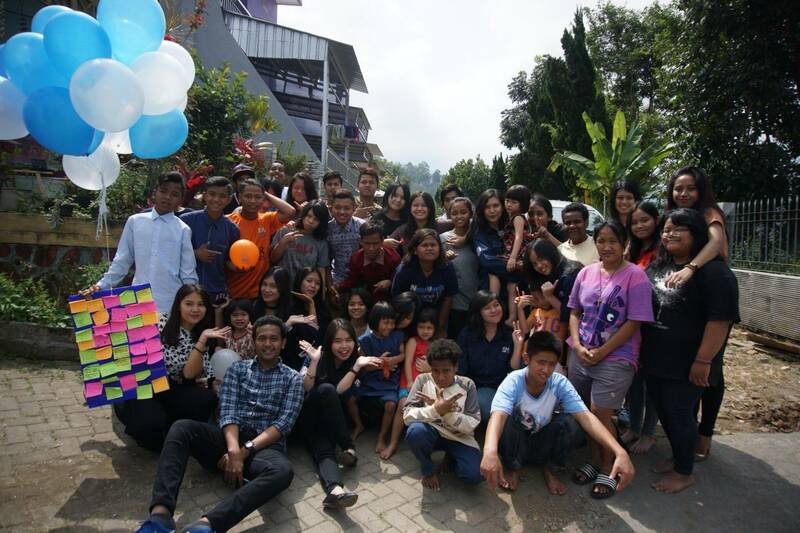 This easter celebration is celebrated with charity event and sharing with the members of Villa Cherry Orphanage. The response and the spirit from the members of Villa Cherry Orphanage made this Easter celebration that’s presented by KMK FEB UB felt so festive. Not only the members of KMK FEB UB, alumnae are also invited to come to and brighten up the celebration. It will start sharply at 10 am with a warm opening from the MC and prayer, opening speech from the chief executive of the celebration as well as from the faculty coordinator, introduction of KMK FEB UB to the members of the Villa Cherry Orphanage, followed by the ice breaking games and division of group. The ice breaking was conducted by the games “Who Am I?” In this games, the members of the Villa Cherry Orphanage will guessing and looking for the committee after explained about the characteristics of the committee. After that, the event continued with singing a happy song with members of the orphanage and Mosaic game. From this game, the orphanage children will learn about patience to produce something beautiful. The committee with the children of the orphanage will finding eggs together and play volleyball games and newspaper bridges. From the find eggs together and other games performed, it is revealed that the celebration of the Passover is an event of the resurrection of the Lord Jesus Christ, which reflects that God has removed the sin of mankind through the sacrifice of the Lord Jesus Christ. Therefore, we are His children must always renew themselves to be someone better and always obedient to Him. The peak of KMK FEB UB’s Easter celebration was done by writing the hope of the orphanage children who then flown and the distribution of Easter gifts. The orphanage children looked very happy after receiving a gift from KMK FEB UB. Then, the event continued with symbolic handover of donations from the Chief Executive to the administrator of Villa Cherry Orphanage. 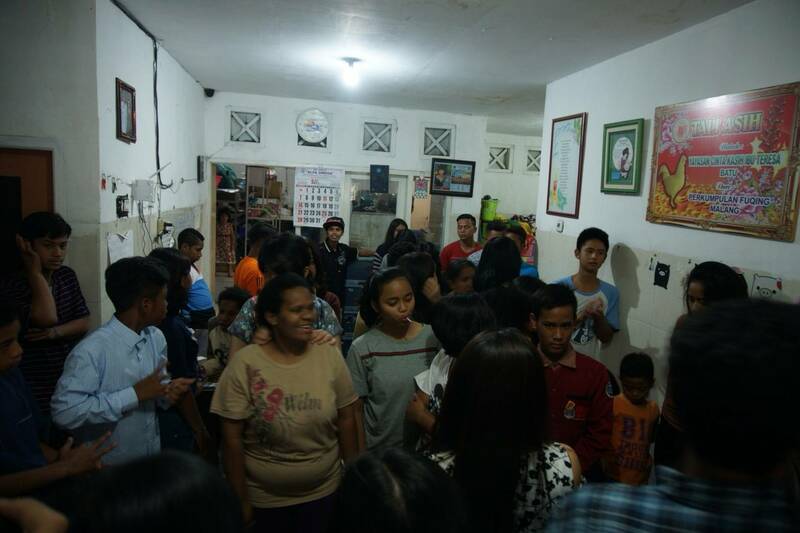 KMK FEB UB Easter event closed with prayers and photos with all members of the orphanage. The celebration closed by prayers and the committee take a photos with all the members of the Villa Cherry Orphanage. With the end of the Easter celebration by KMK FEB UB 2018 which was attended by 40 people, it goes along with the hope that it may maintain communication, create a sense of family, love and self-awareness between Catholic colleagues of Faculty of Economics and Business Universitas Brawijaya, and may develop the talents and creativity of the committees to create a better event.